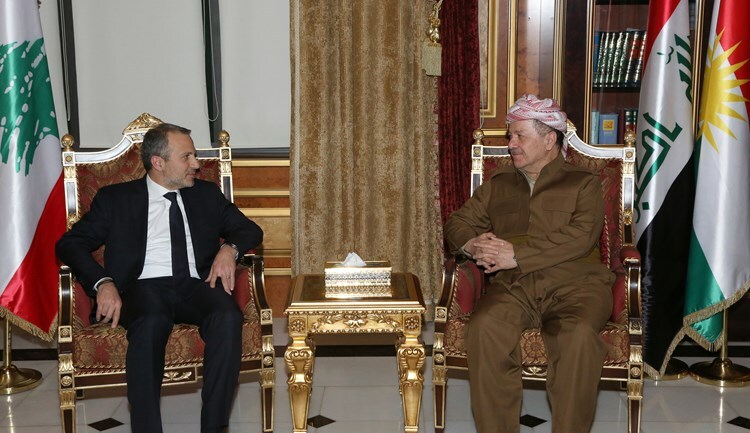 President Masoud Barzani received a Lebanese governmental delegation headed by Gebran Bassil, the Minister of Foreign Affairs and Emigrants. The delegation also included a number of senior advisers in the Lebanese government. President Barzani warmly welcomed the delegation and made reference to the fact that there is a considerably large Lebanese community in the Kurdistan Region. During the meeting, President Barzani and Mr. Bassil spoke of the strong ties between the Kurdistan Region and Lebanon and noted that these relations are of mutual benefit. President Barzani and Mr. Bassil also discussed the challenging times during which the Kurdistan Region took part in the global effort against the terrorists of the Islamic State and how that war and all that came with it, including refugees from Syria and IDPs from the rest of Iraq,, the President stated, was of immense impact on the financial situation of the Kurdistan Region.